I bought a little jug of Knudsen’s spiced cider on a whim last time we were at the grocery store, and it was a perfect accompaniment for those crisp little buckwheat cookies. Once the cookies vanished, I began considering options for baking with some of my remaining cider instead. 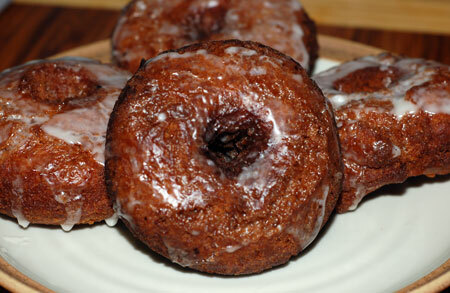 There have been a rash of apple cider doughnut posts in the foodblogging world lately. The recipe that initially made me decide to jump in and make some of my own was this one from JenJen of Milk and Cookies, but I have a hard time justifying mono-use baking equipment like a doughnut baking pan. (I’m this close to talking myself into buying a madeleine pan, though, so I might end up baking my doughnuts one day after all.) 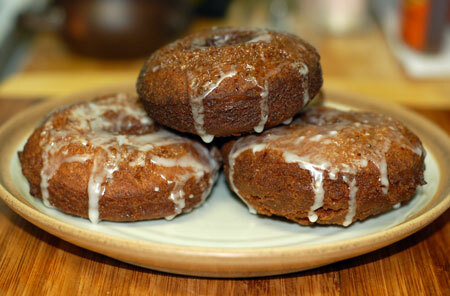 Then I remembered seeing Peabody’s gorgeous cider doughnuts, and knew that’s what I had to make. At the next opportunity—this past Saturday morning—I sprang into action. While Jeremy slept off a late-night WoW session, I reduced cider, soured milk and sifted dry ingredients. The dough came together as he shuffled by to let the pup out back for her morning romp (rain does nothing to dampen her spirits…definitely an Oregon dog!). Because I don’t have a doughnut cutter, I used a 3″ biscuit cutter and removed the holes with an apple corer, a substitution that worked perfectly and felt resonant to me. Then I fried, using my smaller soup pot filled less than halfway up with oil. I was able to do four doughnuts at a time, and just barely had enough oil in the pot to finish the batch—the last three ended up touching the bottom and got slightly scorched. As they came out of the oil, I drained them on paper towels and transferred them to a cooling rack to be anointed with glaze. I think my glazing technique needs work, though, because I had to make a double batch of glaze to make up for the amount that dripped off the doughnuts and puddled on the counter under them. I think they came out very well, and surprisingly doughnut-like in appearance. I definitely need to get a deep-fry thermometer, however, because the temp was hard to regulate with my little hand-held digital, and I think my doughnuts browned more on the outside than they should have, despite my continual fiddling with the heat knobs. Soured milk didn’t seem to do much for the texture; next time I might consider using yogurt or sour cream in its place to try and impart some extra moistness. The other experiment I’d love to try would be getting some buckwheat flour into the dough, which I think would be lovely. I must admit that ate WAY too many of these the day I made them. These really helped boost my doughnut-making confidence: they tasted good, they actually looked like doughnuts, and they were pretty darned easy to make. Thanks so much for sharing the recipe, Peabody!